Currently, the forecast is calling for showers on Saturday, but in the spirit of optimism, we're gonna plan for a mountain bike ride and hope the sun peeks through for us. Twyla will lead this week's trail adventure in Annadel--meet on Saturday at 9:30am on Channel Drive at the bottom of Cobblestone. RSVPs appreciated! The know-how to go now: beginner-friendly, everyone welcome, and no one left behind. Rain cancels! Got questions? 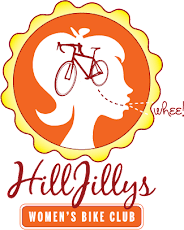 Want to be added to the HillJillys ride and clinic mailing list? Just click the logo above to email us! Want to meet other HillJillys? Find us on Facebook! Our rides are beginner-friendly, for all levels of active women. We're dropping pounds and stress, not you; no one gets left behind. Join us!